Sup Mang Cua, or Vietnamese Asparagus and Crab Soup, has always been one of my favorite soups, and a cherished childhood memory. Growing up, my mom would always make this soup on Sunday mornings. It was our lunch after we got home from Mass. This soup is easy to make, and it offers a lot of versatility in terms of what you put in it. When I was younger, we didn’t always have fresh asparagus on hand, so my mom would use sliced bamboo shoots as a substitute. 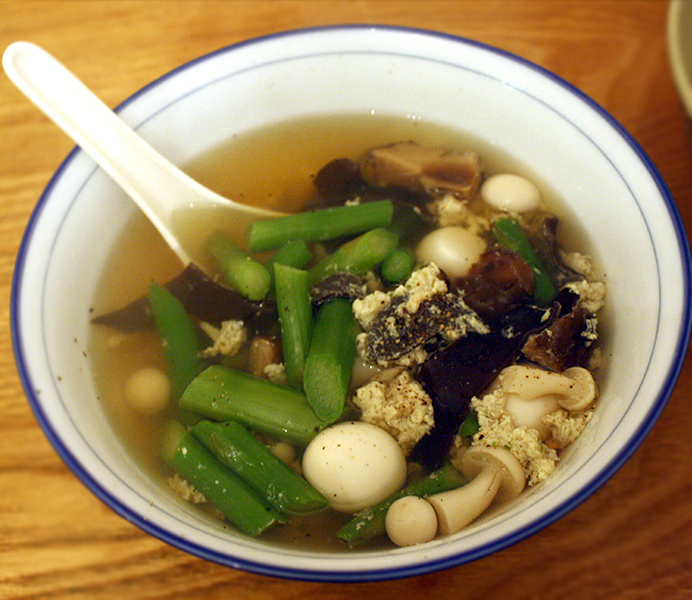 She started adding in quail eggs during my college years, and some people love this soup with baby corn, mushroom, and baby fungus. You can pretty much add in whatever vegetables you like, but there are two mandatory ingredients – crab meat and asparagus (or bamboo shoots). Sup Mang Cua is a light, healthy soup that is perfect for dieters. Many recipes ask you to add cornstarch (or flour), dissolved in water to thicken up the broth, but I’ve omitted this step, because I think the soup tastes fine without the extra thickening.